Do You Dog-ear? 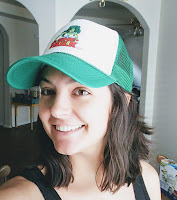 : It's My Birthday Giveaway! 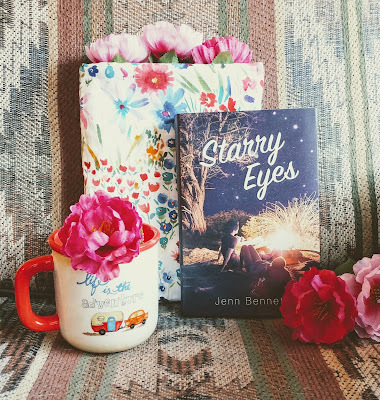 I decided to give away one of my favorite books this year: Starry Eyes by Jenn Bennett (read my review here). There's also a flowery book sleeve and a mug that says "life is the adventure," which is so true! I am constantly reminding myself to enjoy the day and live in the moment, because I don't want to miss anything! This giveaway officially starts on June 1, 2018 and ends on June 29, 2018. The winner will be announced on June 30, 2018 (my birthday!) on this post within the Rafflecopter form - and also notified by email. The winner will have 48 hours to respond or I will choose another winner (read my full giveaway policy here). International entries are okay but not for the prizes shown. I wanted to make sure everyone was included, so the international prize is just going to be the book Starry Eyes by Jenn Bennett from The Book Depository. Just make sure they ship to your country (← hover over the text for the link). To enter – fill out the Rafflecopter form and answer the question: Do you like to go camping? Truth. For awhile my husband and I were sharing a car, so it made it difficult for him to go backpacking if I had to work. I hope you're able to go soon! Happy Birthday! You’re too nice. Thank you! Have you tried before? Is it just camping in a tent, or all camping in general? I prefer renting a cabin because it feels more homey, so I'm wondering if that would work for you, too. HAPPY BIRTHDAY!!!!!!!!!! I do enjoy camping, but it depends entirely on who I am with and what season we're camping in! THANK YOU! I can understand that... the people you're with and where you are can make all the difference in the world. Camping with my in-laws on a beach (something they've suggested for this summer) does NOT sound fun. Camping in the mountains (in a cabin) during the winter with my family seems romantic and fun. You're very adamant! Is there a reason you don't like camping? Thanks so much! Ohhh, I've never tried camping on a beach! I think the sand would drive me crazy! It gets everywhere... sleeping with gritty sand would be a nightmare. I think my husband went beach camping with his family once. There was a terrible storm and all their tents were sucked away and they made a speedy retreat home. Haha! I think we all did things as teenagers that we wouldn't normally do for an excuse to get drunk and be mischievous. I don't mind camping in a cabin with electricity and running water. It's the bugs that bug me. That's too bad! Do you have a reason? Happy early birthday! Fun giveaway! I used to go camping a lot when I was a teenager - now I like hotels, but I'd consider glamping! Happy Birthday Month!! I love that your birthday is June 30 - mine was MAY 30. :) My sister's is actually June 27 though. As for camping...I haven't been since I was little. I think I'd rather do RV camping than tent camping, so I can get better sleep. haha A friend of mine loves it though and goes a lot with her family and fiance. That's awesome! I think my preference is cabin camping, RV camping, and then tent camping. I prefer the small comforts, lol. I also DO NOT get along well with insects. It's like they seek me out to deliver their torture. My husband loves to go backpacking and sleeping in a tent. He usually takes our dogs with him! Oh that mug is cute!! We're thinking abut getting camper so we can travel with the (fur) kids more. I know! I was tempted to keep it for myself, lol. We've been thinking about getting an RV for the same reason! It's so hard to travel with pets, and most hotels aren't that accommodating. The ones that are have super strict rules, too. Let me know what you decide to get and if you like it! It is! Have you read a Jenn Bennett book before? I have not! I've heard good things about that one though, and of course the cover ALMOST makes me want to go camping lol. Almost?? Haha! I would recommend this one and Bitter Spirits! They're my two favorites so far. My family and I would stay in cabins, so I've never actually gone camping in a tent! My husband goes all the time and thinks we should do it as a family. I'm actually a little scared by this and use the kids as an excuse! "They're still too young..."
Happy (almost) Birthday, Lindsi! I haven't really done a lot of camping but have had fun the couple of times I had the chance. Thanks for the giveaway! What kind of camping did you? Cabin or tent? I really want to go stay in a cabin again! It's fun just to get away and be in nature for awhile. BUGS are the WORST. I've never camped in a tent before, but I have stayed in cabins without running water. You had to trek through the wilderness to an outhouse to shower, brush your teeth, pee, etc. It wasn't too bad unless it was raining or really cold! The cabins still had electricity, which was nice. Thank you! I cannot believe I'll be 29 this year! I feel like high school was just a few years ago. As for camping, yeah can't say I'm the fan. LOL!! I love nature, but that's just a little too much for me. Thanks! I feel like most people dislike camping unless it's in a cabin with electricity and running water. We're spoiled, haha. I loved the flowery design! I got a little something similar for myself because I liked this one so much, lol. Happy birthday, Lindsi!! I only like cheater camping---in a cabin. It doesn't have to be fancy at all, but I can't sleep in a sleeping bag on the ground. At all. It's terrible! It's not cheating! I firmly believe that is a legitimate way to go camping! You leave home for a few days, stay in the woods and enjoy nature, and have the basics provided! I'm not sure how I would feel about camping in a tent... it's the bugs that bother me. How to you keep them out?? This is so fun! Happy early Birthday! I absolutely love camping. We try to go a couple times a year, and honestly I'd rather be camping than most places. How fun! Where do you go camping? Some people prefer the woods, but I know a few that like to camp on the beach. I feel like the beach would be too sandy, but the woods are full of bugs. I'm a mosquito magnet! It doesn't matter what spray, bands, etc. I use. They always come and feast on my lifeblood. Good luck to everyone who enters, such a brilliant prize and happy upcoming birthday Linds! I'm not one for camping, but I've seen a few luxury camping holidays online and they look pretty good! There's one called roar and snore and although cheating a little, it's camping in luxury tents at the Sydney Zoo. You're camping on the banks of the Sydney Harbour and going on night safaris. At $600 per night for two adults though, I'd rather be slumming it in the bush for those prices. Wow! That's intense and seems a little pricey for me, too. I think I'd rather use that money to stay in a fancy treehouse! Have you seen those? They make really incredibly treehouses that have hot tubs, pools, and pretty much anything else you can think of. Happy Early Birthday. Yeah for June birthdays. Mine is the 21st. Camping and I have a love hate relationship. Growing up, my family went camping every year on my birthday so I never got to be home and have birthday parties and go out to dinner. My cake got squished and stepped on and it fell on the floor one year in the trailer. However, I do love being out on the water and the mountains, the quiet and the bonfires. Happy early birthday to you! Yay for June! Did they ask you if that was what you wanted to do for your birthday? My parents took us every spring break, so I can understand the frustration. My friends would all make plans and I would be going out in the woods for a week. Other families would go, too, but it just wasn't the same. We stayed on a big camping ground that was really nice. There was a lot to do in the area, except eat... you had to bring everything from home and cook in a shared kitchen that was in a separate area. The bathrooms were a ways away, too. I'm so sorry about your cakes! That's so sad! I think I would cry, lol. We went on my birthday twice, and I believe we did s'mores both times instead of a cake. Bonfires for the win! We went canoeing/kayaking every year we were there (very cold in March), and almost drowned one year when my parent's canoe flipped in the rapids and pinned me to a rock. A sweet old man happened to be fly-fishing nearby and saved my life. We found out later he actually owned the canoeing place, so we were able to go for free after that. It was also the last time I rode in a canoe with my parents. I took my chances kayaking after that! They would argue too much and eventually my mom would refuse to paddle, which is how we ended up going over the rapids sideways and flipping over. I always had better luck after that. What about camping in the fall/winter? I think I would prefer that! Less bugs more fire! Oh wow! Enjoy your month Lindsi, and Happy Birthday! Have you ever tried camping before, or do you just know it's not something you'll enjoy? I don't think tent camping is for me, but I'm willing to give it a shot one day! For now... cabins and water and electricity! Happy early birthday, Lindsi! I hope you have an awesome month. In answer to your question: I sometimes like camping, but I much prefer the kind of camping where you stay in cabins instead of tents! Haha. I don't really like camping in the summer! It's too hot and lakes always make me feel gross, lol. I prefer cabin camping in the fall/winter! Preferably in the mountains! Aaaaw happy birthday!! I hope you had a good one! June 1 was my grandparents anniversary. A good day all around :) I just love her covers. They're so captivating. Ha! No. I don't camp. I don't really like to touch nature if I can help it. lol Thanks for the giveaway! Have you seen the cover for hew newest book?? I think it's going to be released in April next year... it's gorgeous! My issue isn't touching nature, it's the things living in nature touching me! Oh, but there was one time I brushed my arm against a bush and the entire thing broke out in some sort of rash. We never did figure out what it was because it didn't seem to do that to anyone else. You're allergic to ALL bug bites? I would never leave the house! Maybe I'd move somewhere really, really cold... haha. People have given me suggestions over the years that are supposed to "work every time." Just to name a few... eat more bananas, don't wear blue, and rub yourself down with a dryer sheet before going outside. None of these things have worked, but I did try them, lol. I like camping in a cabin, but you're right... reading about them is much better! Happy birthday! I used to enjoy camping in a tent, but now I think I'd need an actual bed in a camper or RV. I used to love to go camping when I was young and kidless but now my body aches and the kids are busy with activities that we don't make camping a priority. Also, now that I have a beautiful house I don't want to "rough it" like I practically did living in my first few apartments when I camped more often! lol. You don't want to share a tent with your entire family? They make those... "family tents," lol. If we went camping as a family, I would prefer to stay in a cabin or RV. There's more room for everyone! Maybe one day (when the kids are older) we will all go camping together in tents. I love to go hiking! We'd strap them into a harness when they were little, but now they are able to go short distances on their own. Hope you had a good birthday! I do like to go camping, I just don't very often.